The first of November marked International Project Management Day, which was an opportunity to recognise the valuable contribution that highly skilled project managers make to project success. It’s also an opportunity to look to the future, and what is needed to prepare Australian industry to operate in an increasingly complex world. In the 2018 Pulse of the Profession report, Success in Disruptive Times, PMI estimated that “9.9 per cent of every dollar is wasted due to poor project performance”. The good news is that since 2013, this figure has been reduced from 13.5 per cent to 9.9 per cent. This reduction is attributed to increased awareness of the importance of project management, and increased investment in project management capability and training. The ADF will invest nearly $200 billion in capability over the decade to FY 2025-26. This investment includes the procurement of next-generation aircraft, submarines and armoured vehicles, and building capability in space and cyber. It also includes expanding sovereign capability through greater collaboration between Defence, industry and academia, and a greater emphasis on exporting Australian capability. The scale, uncertainty, dependency and emergent behaviour of this program requires project managers skilled in managing complexity. Based on PMI’s research, there is a risk that $19.8 billion of the Defence investment could be lost due to poor project performance. To mitigate this risk, and maximise the impact of the Integrated Investment Program, Defence is investing in upskilling project and program managers. This includes increasing their ability to manage complexity. In the early 2000s, it was becoming clear that traditional project management tools and methodologies were insufficient for managing complex projects. In response, the Department of Defence championed the establishment of the International Centre for Complex Project Management (ICCPM) in 2007 and then worked with ICCPM to establish the Complex Project Manager Competency Standards to define the skills and attributes required to manage complexity. ICCPM continues to maintain these standards, and is currently reviewing them for the third time. The objective of the review is to ensure the standards reflect best practice and provide a practical framework for companies to develop their own internal project management and HR processes. 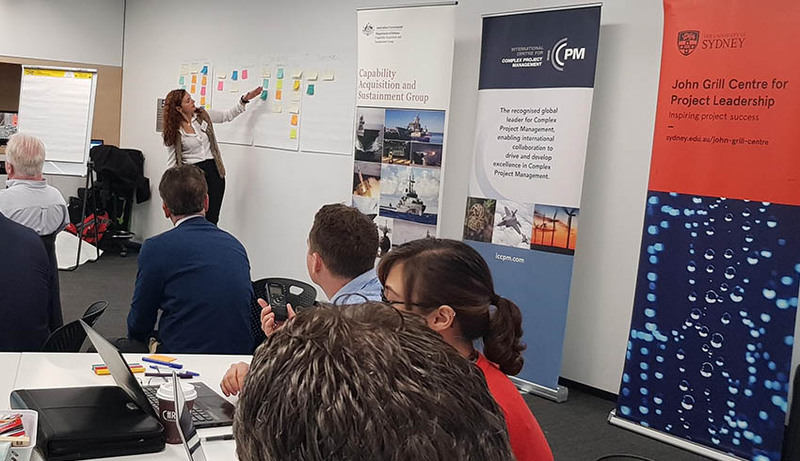 ICCPM has partnered with GAPPS (Global Alliance for the Project Professionals) to review the standards in consultation with CASG and ICCPM's industry partners. Maintaining the standards is only one example of how ICCPM supports the effective delivery of complex projects. ICCPM champions thought leadership through the International Roundtable Series and the facilitation of special interest groups, or communities of practice. As an independent not-for-profit peak body, ICCPM is well positioned to bring together Defence, defence industry and academia to build capability in the management and effective delivery of complex projects. With the growth in the innovation agenda, ICCPM is seeing increased interest from sectors such as digital transformation, infrastructure and energy. The capability in managing complexity developed within defence industry will have a positive impact in other sectors and provide a solid skill base for the nation building projects of the future. The next consultation events of the Global Complex Project Manager Competency Standards will be held in Bali, 23-24 November 2018, and Hungary 22-23 March 2019. Please contact ICCPM or GAPPS for details. The final session of the 2018 Roundtable Series on Leadership in Complex Projects was held recently in Melbourne. Throughout the year, Roundtable events were held in London, Ottowa, the Netherlands, Sydney, Melbourne, Brisbane and Canberra. The findings from these events will be captured in a report that will be released in the first half of 2019. Previous Roundtable reports are available via the ICCPM website. We are delivering three sessions of the one-day training course Managing Messy Problems before the end of the year. Registration is open for Canberra 20 November; Melbourne 22 November; and Sydney 27 November. Registration is open for the next intake of the Cert IV in Responding to Organisational Complexity in Canberra starting 6 February 2019; in Melbourne starting 12 February 2019; and in Sydney starting 26 February 2019. The Complexity Diagnostic Tool (CDT) is now available. This “360 for Projects” helps project managers identify performance risk issues and proposes actions to address complexity in an uncertain environment. We have just reviewed and updated our value proposition for members, including adding two new member categories for smaller organisations and universities, and adding attractive discounts for members. Dr Naomi Mathers recently joined ICCPM as the director, industry liaison and member services. Before joining ICCPM, Dr Mathers worked in the space industry facilitating collaboration between industry, academia, government, and Defence. In this capacity, she identified the need for increased capability in managing complexity and complex project management. For more information about ICCPM, visit: www.iccpm.com.